Helping local charities & clubs with our minibus - Helping local people with project funding. As a charity we rely on the support of local businesses, clubs and groups. Here are just some of those that support us. 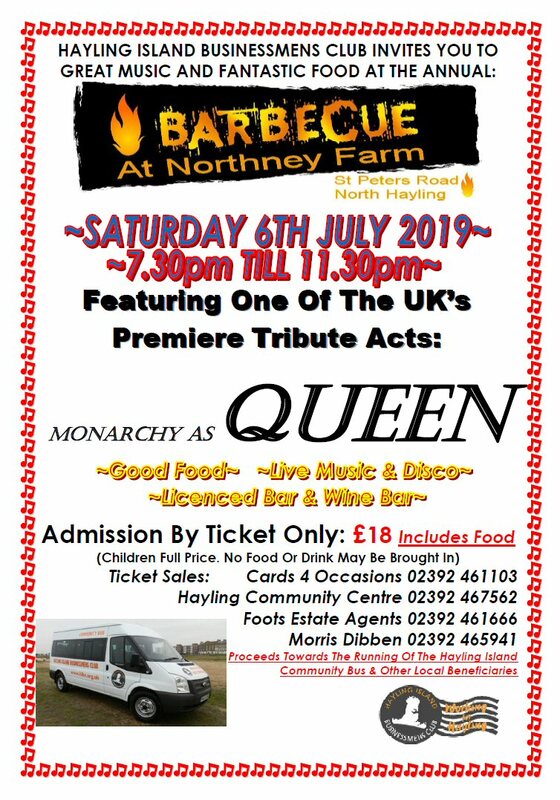 Saturday 6th July 2019 sees the return of our annual summer BBQ at Northney Farm. This year we have live music in the form of a Queen tribute band headlining the evening with all the usual fun games and DJ inbetween. Of cours there is also BBQ food included in the ticket price and a fully licenced bar to help the evening go with the usual smiles and enjoyment. Tickets will available shortly from the listed outlets. The Hayling Island Businessmen’s Club held its AGM in January, at which outgoing Chairman Peter Blake thanked all members for the support over the past year. He stated it had been a successful year, especially for the funding raised and how it had been distributed to local good causes, as well as keeping the Community Mini Bus in use seven days per week for local groups and charities to use. He left the club in a good position, with new members joining so he was delighted to hand the role of Chairman over to Marcus Foot. Marcus has been a member for some years and is looking forward to his year in the Chair, having had several roles within the club. Many of our members were at the Club in 1989 when Marcus’s Father Geoff was Chairman. Geoff sadly died some years after this but is still fondly remembered by all of us. The older members all recall Marcus as a young lad coming along with his dad and helping at our annual BBQ at Northney Farm, however Marcus, now dwarf’s nearly all of us at the club. The Club put on a very successful Christmas Party at Sinah Warren with over 200 tickets being sold. It was a wonderful event to celebrate Christmas and particularly good to see so many local firms attend. A great time was had by all, so a great big thankyou to the Management, staff and entertainers at Sinah for hosting the evening. On Friday the 21st December the club held its annual street collection in Mengham at which a very healthy £349 was raised. All monies raised with no expenses deducted will be distributed to local good causes or to support the running of the Community Mini Bus. On a sad note our Secretary Malcolm Newnes has had to retire from the club for personal reasons. Malcolm has been a willing volunteer since joining the Club in 2008 having found his niche in the role of secretary at which he excelled. I think though, most of you reading this will remember Malcolm as the Race Marshall at our very successful pig racing nights each year. We all sincerely wish him the best of luck for the future. The club members met the shoppers at the new Lidl stores on Hayling while collecting outside the store for club funds. We had on display the community bus and our club banners. This event proved successful, with many shoppers giving willingly, and recognising the good work for the Island community carried out by the club. The total collected was £254.90. Our next collection for club funds is in Mengham on Friday 21st December again look out for the Community bus and listen for festive music. If you see us and can contribute to the collection, we will be very appreciative, and you can be sure that every penny donated goes towards worthwhile causes on the Island. The club’s final luncheon of 2018 is on the 20th December, and we anticipate that all members will be in attendance, to welcome our guest local MP Alan Mac. We will be treated to a secret Santa, who will enable members to exchange gifts (they have purchased to a minimum of £5) with other club members, not knowing which of the wrapped gifts they will receive in return. Our fortnightly Luncheon meetings although working to the meeting agenda, are relaxed, and allow for friendly banter between members. The 80 tickets provided by the club free for the senior citizens on the Island to attend the pantomime performance of Goldilocks and the 3 Bears at the HIDS theatre on Monday 14th January have been distributed. I am pleased to report that the club has donated to many worthy causes this year and the latest are: – the ‘Happy Feet and Toddler group’- the group under Lindsey Wilson conducts a weekly session on Thursday mornings at Hayling Island Community Centre for toddlers/babies of local parents/carers to meet and have fun in a controlled environment, also towards a Christmas party for deprived children, also the Hayling First Responders towards their essential services. Club member Dave Stanway was delighted to announce that he has serviced 2 laptops with a further 2 to repair for use by the ‘Job Club’ who meet at the HICCA. The name of the club can be a little misleading and it is not necessary to be a Businessman to join! Any gentleman who has the time and the interest to be part of a club with the Ethos of helping the less fortunate can apply for membership. In addition to aiding this worthwhile cause through the planning and arranging of events, there are several social gatherings throughout the year, for members, partners and guests, the combination of these events enables members to build close relationships and find friends for life. Once again, the HIBC senior citizens Christmas Party and pantomime was held at Sinah Warren hotel. 300 Senior Citizen party goers were welcomed by club members at the entrance to the theatre, our party goers quickly seated themselves in the theatre to allow the Hotels entertainment team to commence the proceedings. The pantomime this year was ‘Puss in Boots’ and all guests were joining in and enjoying the show. The consensus after the show was the best Pantomime to date. After the pantomime the Hotel staff efficiently served refreshments and cake to our guests. Traditionally the afternoon finished with everyone joining in the 12 days of Christmas, all were in good voice with entertaining actions, prompted by the entertainment team. The club members thank the management, and staff for allowing the party at the Sinah Warren Hotel in their recently updated theatre. Note: – Every year all tickets for the Christmas party are suppled free to our party goers. The club takes satisfaction that it is helping the senior citizens of the island to enjoy an entertaining afternoon with friends. A few days after the Christmas party our annual Pig racing night was held at the Community centre. This is a fund-raising event with the proceeds helping towards the island Community bus, and other local worthwhile causes. This year over 100 tickets were sold, and all tickets holders had a tasty supper during the pig racing. Watching the piggies race each other is very entertaining because you are never sure that they will reach the finishing line, before knocking into each other, or even falling over. I should mention that the pigs are battery powered and are auctioned at the end of the evening. Betting on each pig, and sponsoring pigs is welcomed, it is possible to go home with more loose change in your pocket that you started with. I am sorry to say that this is the last time that our Secretary Malcom Newnes will manage this popular event. Do not forget to book your table for our Christmas party at Sinah Warren hotel on the 21st December, see our advert in this paper. The club has also distributed 80 free tickets for ‘Goldilocks and the 3 Bears’ Pantomime held at the HIADS theatre, in January 2019, again to benefit the elderly on the island. The Club was formed in 1964 by a group of local businessmen as a way of returning something worthwhile to the community, which supported their various businesses. It was thought best to support the less privileged in our society by means of various fund raising events. This is still basic philosophy and there are now two key fundraising events each year. The annual BBQ at the Northney Farm and the Pig Racing Night currently held at the Hayling Island Community Center, West Town.